Card Text Action: Purge a creature in play. If you do, your opponent gains control of Spangler Box. If Spangler Box leaves play, return to play all cards purged by Spangler Box. If I use Spangler Box and my opponent gains control of it, does it ready at the end of my turn? No. During the “Ready cards” step of your turn, you only ready cards you control. Therefore, Spangler Box will stay exhausted for your opponent’s next turn and will ready itself – as normal – at the end of your opponent’s turn (during their own “Ready cards” step). 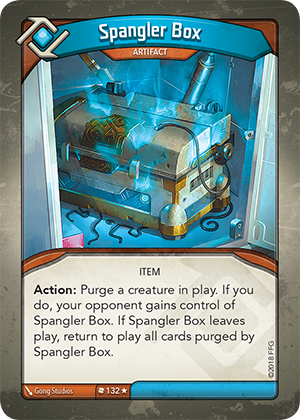 If Spangler Box leaves play and the creatures purged by it are returned to play, do those creatures trigger their “Play:” abilities (if any)? No. “Play:” abilities only trigger when cards are played, not when they are “returned to play” or “put into play”. Therefore, when creatures are returned to play from Spangler Box, their “Play:” abilities do not trigger. My opponent played Remote Access to use a Spangler Box under my control. What happens to Spangler Box? You keep control of Spangler Box. When your opponent uses Spangler Box (even through another card or ability), you gain control of it. Since you already control it, you just retain control. If a creature is purged by Spangler Box, does its “Destroyed” ability trigger? No. “Purge” and “destroy” are two different methods of card removal. Therefore, since Spangler Box only purges the creature, “Destroyed:” abilities do not trigger.